I love overcoats. Military or civilian, Confederate or Federal, capes or hoods, mounted or foot pattern, I just love them. One of my favorites is the overcoat for mounted services. 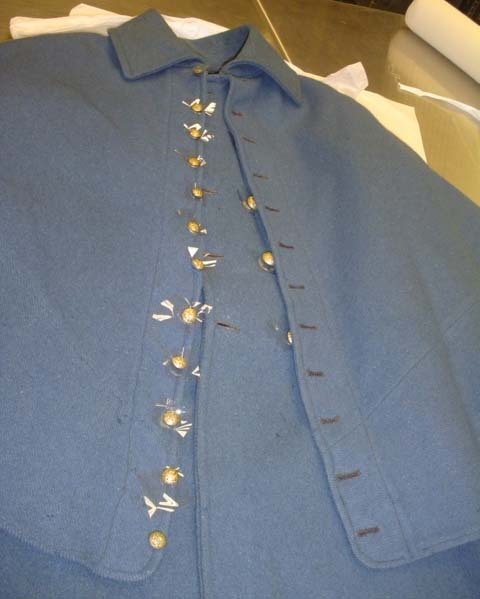 These coats not only served as warm weather outer wear for Engineers, Cavalry and Artillery, but also saw service in the 1880s serving troops during the Indian Wars. The coat pattern changed very little in the 25 years it saw service, and there are a score of originals that survive for us to examine today. One of these coats resides in the Gettysburg National Military Park. 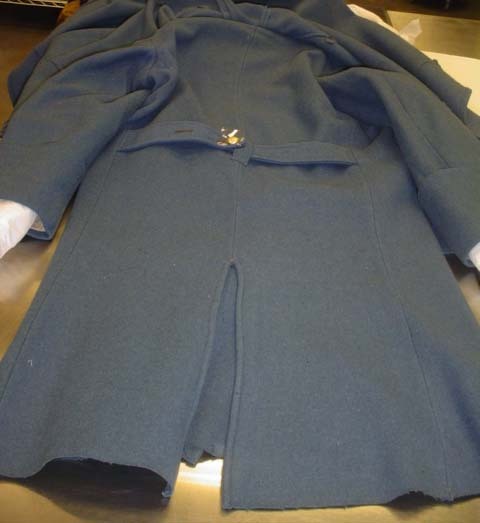 The coat is in good condition and has no signs of wear. The park service had done some repair work ( noted in the picture of the underside of the cape). Most of the lining has been backed by the park service to protect it from further damage. The coat is inspected by F.H. Shafer of the Cincinnati Depot, who worked there from September 63 to June 65. 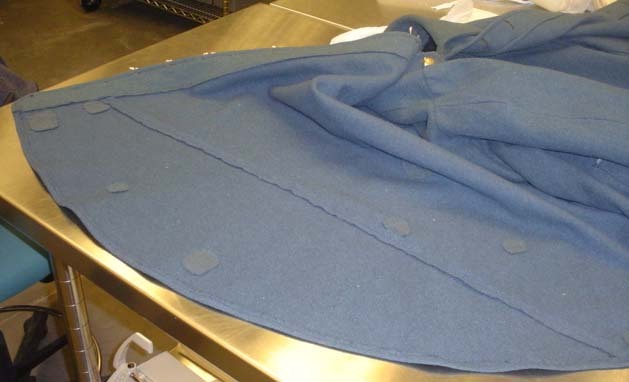 While the coat was produced during the war, it was never issued and was later treated by the Cowels moth proofing process after the war. The material for the body is a sturdy wool kersey. The color while originally a sky blue now has a greenish tint due to the moth proofing process. It's lined with wool sack coat flannel. The sleeves and reinforcing pieces are cut from cotton drilling. 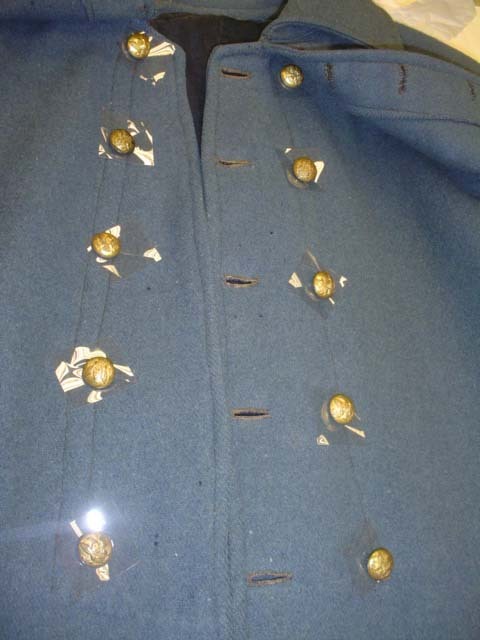 This coat is typical of most of the contract coats I've seen and conforms to the pattern subscribed to by the quartermaster. This coat has a 4-piece body, 2-piece sleeve and 1-piece collar. It has a 12 button cape and a 5 button front (the QM Manual called for a 6 button front). The coat is double breasted, but unlike most double breasted garments only has buttonholes on the left side. 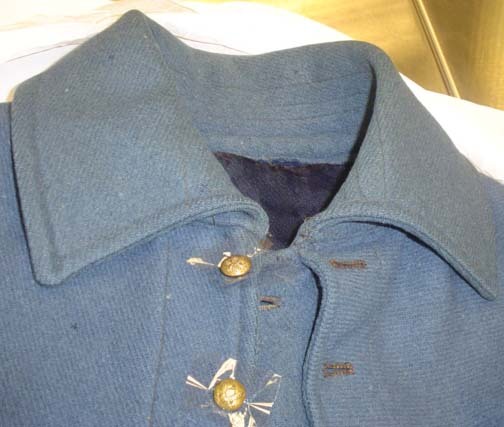 The manual also calls for two hooks and eyes on the fall down collar, but this example showed no signs that they were ever inset into the seam or attached on the outside of the collar. The cape which is a 12 button front vs. 6 buttons on the foot version. 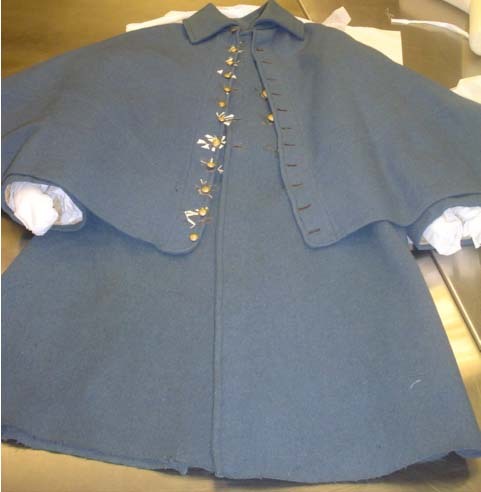 The mounted cape on this example was 27 inches in length and had a center seam in the rear. The piecing you can see in the photograph to the right is not a function of the pattern or for strength, but rather to get the cape to the proper length when cutting on yard goods that aren't the proper width. Another feature is the vent up the rear, while the foot pattern also has a vent, the mounted pattern is considerably longer (14.5") to allow for the wearer to sit properly on a saddle without having to unbutton the coat. The fall down collar vs a stand up collar is another feature of the mounted overcoat. This one is 5" high and was cut from one piece of kersey (which is an odd waste of fabric since other parts of the coat are heavily pieced). 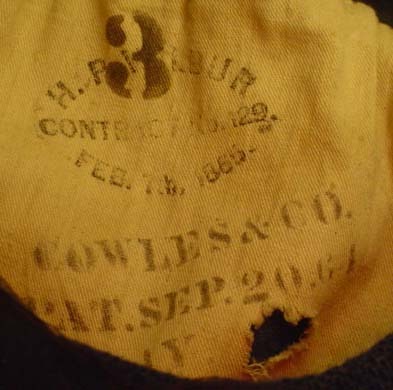 Given the coat was marked a size "3", the only real reason it wasn't issued during the war was it was made near war's end and sold for surplus after the war. This is again an excellent example of a contractor coat and is similar to the one we'll be reproducing later this winter.